This is SO easy. And SO awesome. For realsies. This could be the BEST tip I’ve ever shared. Did I conjure this up myself? I’m not 100% sure…but it’s too good to keep secret. OK, say you’ve made a batch of Brownies (recipe below) or a One-Bowl Chocolate Cake or even an Hot Milk Sponge Cake (super light and fluffy). Would you LOVE to drench your creation in a dreamy, creamy, fudge ganache? Don’t have the time to make frosting from scratch? Or you’re out of powdered sugar? Don’t want to resort to that chemically-laden and overly processed frosting in a can? Here’s the ONLY ingredient you’ll need. You probably have a package of semi-sweet chocolate morsels around, right? I mean, ‘cos who doesn’t, ya know what I’m sayin’? In one easy step, you’ll create a to-die-for topping. Take a handful of chocolate chips; I think this is about 1/2 cup. 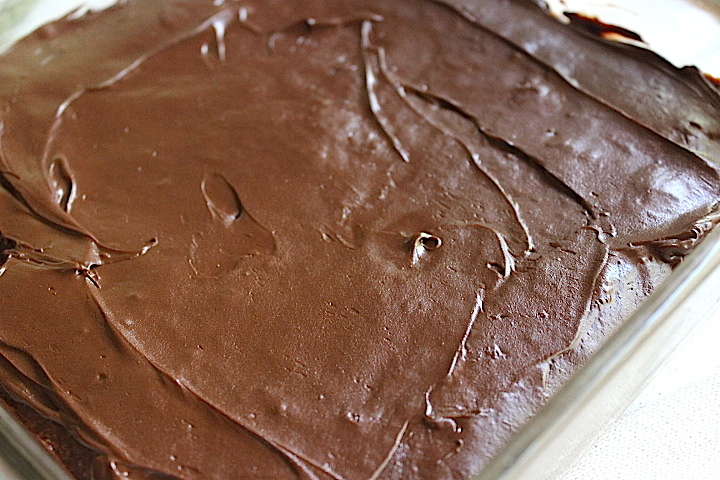 Sprinkle the chips evenly over just-out-of-the-oven brownies (or cake). Simply take a butter knife or offset spatula and spread the melted chocolate chips gently over the top. Look how glossy and shiny and YUMMY chocolaty good that looks. A no-brainer, it’s a success EVERY time. It starts out soft and if you’re like me and store any leftovers in the refrigerator, the topping develops into a firm but not too hard coating that serves to protect and preserve each and every moist mouthful. Works great on cookies, too. I’ve never tried milk chocolate/mint chocolate/peanut butter chips, but I assume they’d be good; if you try them, let me know! 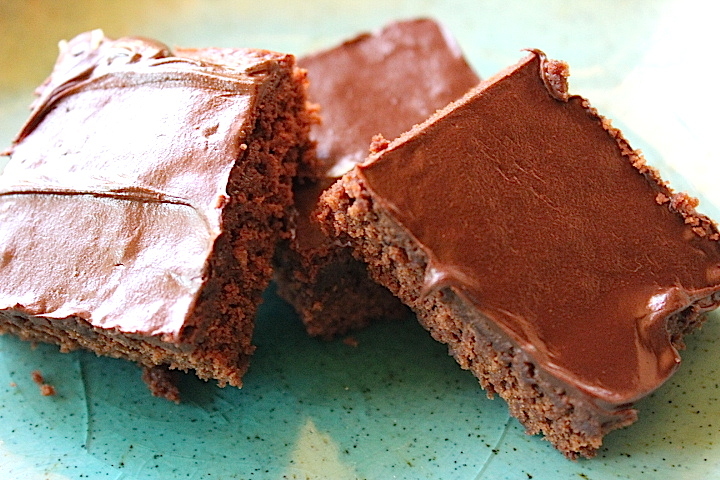 Here’s Princess Rosebud’s Brownie recipe. One bowl, super easy! Mix thoroughly oil, sugars, eggs, vanilla, coffee. Incorporate cocoa and mix well. Add flour, salt, baking powder, and nuts, if desired. Stir together, but not too vigorously. Bake at 350 degrees for about 20-25 minutes just until the edges pull away from the pan. No one likes dry brownies! This entry was posted in All Posts, Recipes & Food, Mostly Vegan and tagged Baking hack, Baking powder, Baking tip, Best baking hack, brownie, Brownies, Cake, Chocolate, Chocolate brownie, Chocolate cake, Chocolate chip, chocolate chips, chocolate frosting, enchanted seashells, Ganache, Hack, Ice cream, Icing (food), Powdered sugar, Tugboat Captain, Types of chocolate by Enchanted Seashells by Princess Rosebud. Bookmark the permalink. I am at work, please have the brownies delivered to me directly. Thank you. I have no idea where the recipe is now, but I used to make a Mississippi Mud Cake that called for Hershey bars to be melted and spread over the top. It’s a good idea but that one I read about 35 years ago. Still, you found it all by yourself! Actually if I remember correctly, one time I was out of chocolate of any sort and hub said why not use chocolate chips and I experimented and there you have it. He LOVES chocolate. But it’s so EASY to make! One bowl, just chocolate chips for a topping. And no butter (or coconut oil haha). Do it!! Well, OK, maybe I’ll have to try again with C.oil. It just seems a big heavy. If you do use c oil in this recipe, I’d try it with less, like 1/3 cup. This does NOT work with cinnamon chips. No, I don’t imagine it would. But did you try? I’m all about the chocolate, I’ve never tried anything else. In fact, the entire project came out ghastly. Well, I wasn’t blaming you, but that’s mostly because I didn’t realize that was an option. Great idea and have used it a few times. Tastes Great and thanks for the reminder! Ha ha, if I had to do that, it would be too depressing. I know how many calories there are in chocy chips, it’s not good. My brownies aren’t too bad cos of no butter. How about just one small square? I’d most likely eat the chips before the brownies come out of the oven. You can do that too! No worries, just add more to the topping. Totally acceptable!